Hi Everyone, Its been a long and interesting week in my tarot world and I wanted to share in a more informal, conversational post. I recently began doing e-mail readings through Biddy Tarot’s Free Reader Network and its kinda thrown my world for a loop. I don’t really know where to begin, so I will begin at the beginning I guess. I’ve been studying tarot and reading for myself for about a year, a little less. Recently I’ve been feeling like I needed to start reading for others to really expand my skills and continue to grow as a tarot reader. 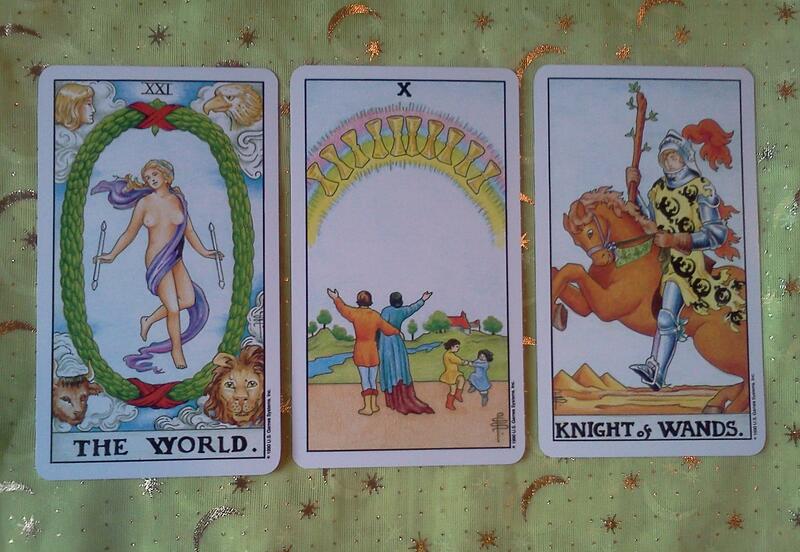 Also, I really enjoy reading tarot and you can only read for yourself so often. I came across Biddy Tarot while doing research on the internet and discovered Bridgit’s page about becoming a free reader. The Biddy Tarot Free Readers Network is an amazing resource, where tarot readers of all levels from student to experienced can offer free readings via e-mail in exchange for feedback from their clients. This sounded like the perfect environment for me to test out my tarot skills, to learn and to grow. As a tarot student or novice tarot reader, I couldn’t think of anything more valuable than feedback. You could have knocked me off my chair, you can’t get much more of a positive affirmation than that. 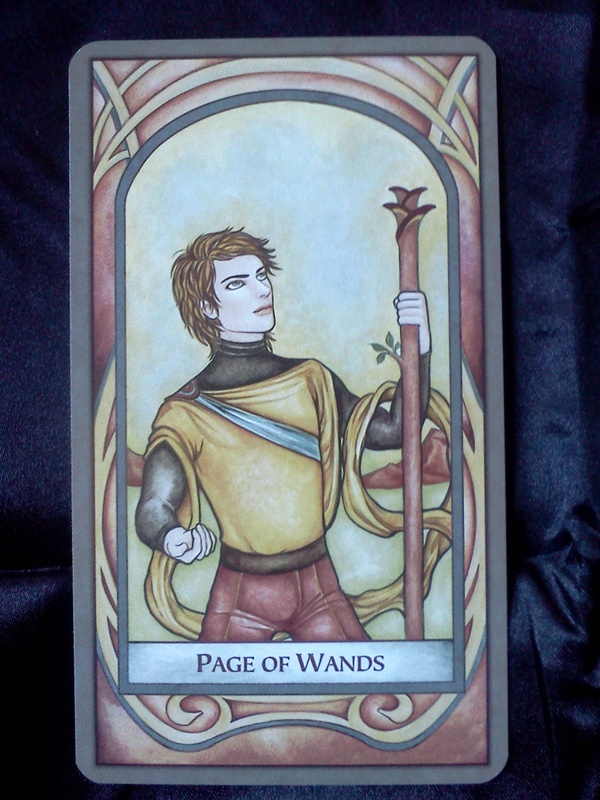 I saw the Knight of Wands representing myself taking this action to become a free reader. Since the Knight was moving decisively to the left, it became clear that he was moving towards the Ten of Cups, indicating that moving forward with this plan had the potential to bring me a great deal of emotional satisfaction. Beyond that lay The World, which said to me that not only could this decision bring me a great deal of joy, but it was an important step on my life path that would profoundly impact the next stage of my life and also heralded the beginning of that next stage. Talk about intense. Needless to say, I went ahead and signed up with Biddy Tarot and I’ve been reading via e-mail for just about a week. It has brought me a lot of emotional satisfaction and I’ve already learned a lot. Its scarier than I anticipated. I was very excited to get my first request and then I read the question and promptly panicked. Its amazing how much heavier and bigger of a deal it seems when its someone else asking for guidance. I had to take a lot of calming breaths to quiet the self doubt thoughts in my head. I kept thinking about the Eight of Swords and being captive to my thoughts and how I didn’t want that to hold me back. I really did have to learn to trust my intuition and the cards. Getting a reading request over e-mail is impersonal at best and that is one thing that I don’t like about it, no real client interaction. Its hard to get a one sentence question, lay the cards, find the story and the connections when you are in a way flying blind. I remember one reading I did where the cards told me a pretty elaborate story and I felt like there was no way they could be accurate with that level of detail, but I took a deep breath, trusted my inner High Priestess and sent it off. Turns out I had gotten most of the information right. You can’t hit the nail on the head 100% of the time, but I have come pretty close more often than not by trusting myself and the cards. Having support is amazing and helpful and comforting and also AMAZING. Being a free reader on Biddy Tarot means the ability to network with all the free readers through the private Facebook group and these are a fantastic, supportive, welcoming group of folks if ever there were. They have such a wealth of knowledge and ideas and creativity. I have to actively let go after each reading. One of the MOST valuable things I have learned to do once the reading is typed up and sent is to let go of it. I actually have a ritual that I do to enforce that action, because I naturally tend to ruminate and hold onto things, so I need all the help I can get. For the ritual I light a sage bundle and state that I release the reading out into the world with my best effort and best intentions. I thank the tarot and my inner wisdom for providing me with insight and now that I have relayed it to the querent I let it go. I then smudge myself and my deck to cleanse the energy. This has helped me immensely. I find I don’t feel as anxious waiting for feedback and I can take whatever feedback I get graciously and integrate it where needed without getting too upset or taking things too personally. I’m sure as the weeks progress I will be figuring things out and learning so much more, but this feels like plenty and quite a bit for now, so i will sign off. Thank you for letting me share this exciting experience with you guys and if any of you are interested in getting involved with the Biddy Tarot Free Readers Network the link will take you to the page with all the info. I should warn you that their are subscription fees involved, but I find the experience and support well worth the cost. This is a courage step you’ve taken. I can imagine how difficult it must be to read for people you don’t really get to know. But it will definitely broaden your skills. English is my first language and I STILL have trouble figuring out which words to use and how to explain things sometimes, *laughs*. I appreciate your encouragement. Also, I went on your Greylady’s Hearth Blog and found it to be quite lovely. I wish I knew how to follow it from WordPress. Yay, you are the first ! I’ve been a free reader with Biddy for almost a month now. Loved this post! So accurate to my experience as well. At first I was nervous about having to read online but it’s surprising easy to get the swing of once you let your intuition run free. So serendipitous that your blog was the first of the recommended blogs that I clicked on. Happy reading! Oh wow. Umm…I might want to do Biddy too, because I’ve been looking for exactly that kind of experience/practice for my Tarot readings. You seem to totally love it. Can you control your influx of clients to fit your schedule? Like if you can only do a couple readings a week, is that cool? Yes, it’s completely self moderated. I do four readings a week currently, but I started out with two and I’ve changed my schedule several times to find what fits my availability best. I have just recently signed up with BTN. Like you, it took me a while to convince myself that I can do it amidst all the negative thoughts about not being ready, not being experienced enough, will people take me seriously….etc etc. Now that I’ve signed up, I haven’t updated my profile yet which means I’ve had no requests for reading. It is my goal to get going this week; I’ll be sure to post on the Facebook Group how things progress from there. Thanks for the encouraging post.